They say Christmas brings out the best – and the worst – in every family. 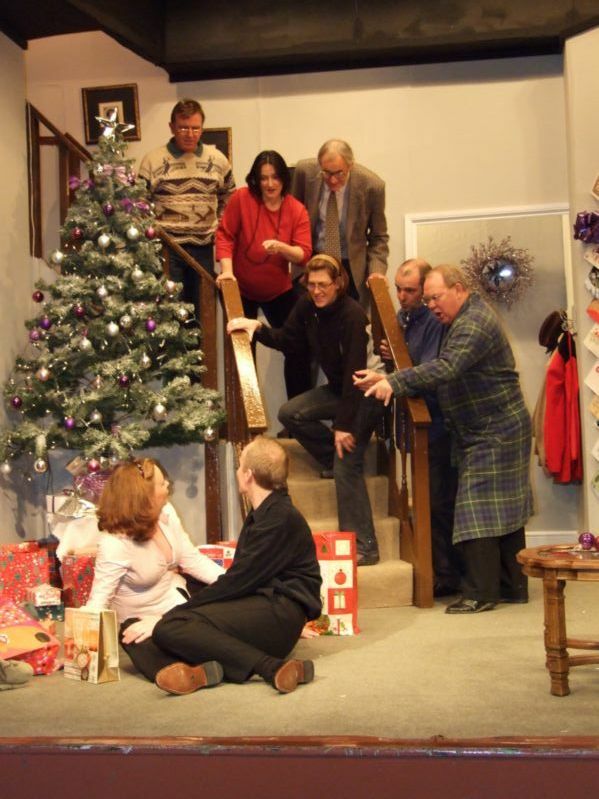 Gainford Drama Club”s Autumn production is a timely reminder of the joys and sorrows of the festivities hovering on the horizon. The characters fight, bully, sulk, cry and get far too excited – and the children of the family never actually appear! Alan Ayckbourn”s popular portrayal of a classic family Christmas certainly reminded some members of the audience of Christmases Past, judging by the passing remarks and gales of laughter prompted by this highly enjoyable and well-executed production. The scene opened on the hallway of a contemporary home with tasteful colour-co-ordinated decorations and a huge pile of presents. Stage settings were created by John Lowery, Paul Richardson and Richard Stephenson, with excellent props and additional detail by Linda Lawrence and Joan White. The sometimes complex sound and lighting were ably managed by the above-named John and Paul assisted by Will Barker, Kathy Kerr and Harry Robinson. It is the night before Christmas and gadget-obsessed Neville Bunker, played by Paul Illingworth has again forgotten to buy his wife a present. Sister-in-law Rachel (Louise Stephenson) is convincing in her fretting about her love life, and bombastic Uncle Harvey (Barrington Wearmouth) is more eccentric than ever, obsessed with giving the children guns for Christmas and sure that any outsider is a thief. His interjections castigating everyone”s efforts are timed to perfection. Neville”s friend and business associate Eddie (Lawrence Chandler) is avoiding his parental duties as usual, while in the kitchen, Auntie Phyllis (Jean McCann) is drunk in charge of their dinner. Phyllis”s inebriation is amiably apparent without being overdone. 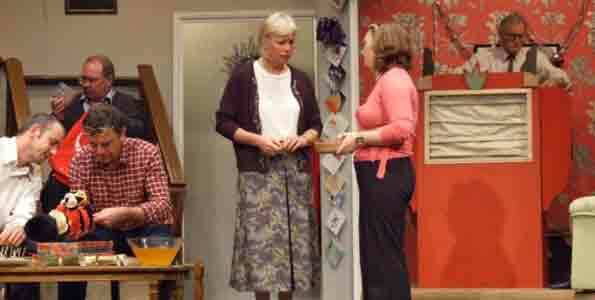 Rachel”s new love interest, writer Clive Morris (James Glendinning) arrives to stay and is immediately smitten by Belinda (Karen Hawley); Rachel”s sister and the neglected wife of Neville. The result of this eclectic mix is midnight assignations, malfunctioning technical gadgets, drunken board games and a puppet show laid on by the hapless Uncle Bernard, superbly acted by John Robinson. His scene with the Three Little Pigs, ably assisted by pregnant Pattie played histrionically by new member Kathrin Glendinning is hilarious. Diana Peat and Pamela Westgarth shared the directing and succeeded in producing some great character acting and confident performances from all concerned. James Glendinning is also a welcome addition in his debut performance with the company, caught up unresistingly with the action. The whole production will provide the audience with an all-too-familiar preview of a family Christmas, at least, we hope, until the final scene…….